Initially a British folk-rock combo called Tyrannosaurus Rex, T. Rex was the primary force in glam rock, thanks to the creative direction of guitarist/vocalist Marc Bolan (born Mark Feld). T. Rex's music borrowed the underlying sexuality of early rock & roll, adding dirty, simple grooves and fat distorted guitars, as well as an overarching folky/hippie spirituality that always came through the clearest on ballads. While most of his peers concentrated on making cohesive albums, Bolan kept the idea of a three-minute pop single alive in the early '70s. In Britain, he became a superstar, sparking a period of "T. Rextacy" among the pop audience with a series of Top Ten hits, including four number one singles. Over in America, the group only had one major hit -- the Top Ten "Bang a Gong (Get It On), disappearing from the charts in 1973. T. Rex's popularity in the U.K. didn't begin to waver until 1975, yet they retained a devoted following until Marc Bolan's death in 1977. Over the next two decades, Bolan emerged as a cult figure and the music of T. Rex has proven quite influential on hard rock, punk, new wave, and alternative rock. Following a career as a teenage model, Marc Bolan began performing music professionally in 1965, releasing his first single, "The Wizard," on Decca Records. Bolan joined the psychedelic proto-punk-rock combo John's Children in 1967, appearing on three unsuccessful singles before the group disbanded later that year. Following the breakup, he formed the folk duo Tyrannosaurus Rex with percussionist Steve Peregrin Took (Stephen Porter). The duo landed a record deal with a subsidiary of EMI in February 1968, recording their debut album with producer Tony Visconti. "Debora," the group's first single, peaked at number 34 in May of that year, and their debut album, "My People Were Fair and Had Sky in Their Hair...But Now They're Content to Wear Stars on Their Brow", reached number 15 shortly afterward. The duo released their second album, "Prophets, Seers & Sages, the Angels of the Ages", in November of 1968. By this time, Tyrannosaurus Rex was building a sizable underground following, which helped Bolan's book of poetry, The Warlock of Love, enter the British best-seller charts. In the summer of 1969, the duo released their third album, Unicorn, as well as the single "King of the Rumbling Spires," the first Tyrannosaurus Rex song to feature an electric guitar. Following an unsuccessful American tour that fall, Took left the band and was replaced by Mickey Finn (3). The new duo's first single did not chart, yet their first album, 1970's A Beard of Stars, reached number 21. The turning point in Bolan's career came in October of 1970, when he shortened the group's name to T. Rex and released "Ride a White Swan," a fuzz-drenched single driven by a rolling backbeat. "Ride a White Swan" became a major hit in the U.K., climbing all the way to number two. The band's next album, T. Rex, peaked at number 13 and stayed on the charts for six months. 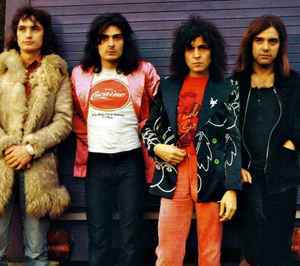 Encouraged by the results, Bolan expanded T. Rex to a full band, adding bassist Steve Currie and drummer Bill Legend (born Bill Fifield). The new lineup recorded "Hot Love," which spent six weeks at number one in early 1971. That summer, T. Rex released "Get It On" (retitled "Bang a Gong (Get It On)" in the U.S.), which became their second straight U.K. number one; the single would go on to be their biggest international hit, reaching number ten in the U.S. in 1972. Electric Warrior, the first album recorded by the full band, was released in the fall of 1971; it was number one for six weeks in Britain and cracked America's Top 40. By now, "T. Rextacy" was in full swing in England, as the band had captured the imaginations of both teenagers and the media with its sequined, heavily made-up appearance; the image of Marc Bolan with a feather boa, and platform shoes, performing "Get It On" on the BBC became as famous as his music. At the end of 1971, Mark Bolan's Wizard Artists Ltd. licensed T. Rex's new recordings to EMI, setting up a distribution deal for Bolan's own T.Rex Wax Co. record label. "Telegram Sam," the group's first T. REX label single, became their third number one single. "Metal Guru" also hit number one, spending four weeks at the top of the chart. The Slider, released in the summer of 1972, shot to number one upon its release, allegedly selling 100,000 copies in four days; the album was also T. Rex's most successful American release, reaching number 17. Appearing in the spring of 1973, Tanx was another Top Five hit for T. Rex; the singles "20th Century Boy" and "The Groover" soon followed it to the upper ranks of the charts. However, those singles would prove to be the band's last two Top Ten hits. In the summer of 1973, rhythm guitarist Jack Green joined the band, as did three backup vocalists, Stephanie Spruill, Pat Hall, and the American soul singer Gloria Jones; Jones would soon become Bolan's girlfriend. At the beginning of 1974, drummer Bill Legend left the group and was replaced by David Lutton, as Jones became the group's keyboardist. In early 1974, the single "Teenage Dream" was the first record to be released under the name Marc Bolan and T. Rex. The following album, Zinc Alloy and the Hidden Riders of Tomorrow, was the last Bolan recording with Tony Visconti. Throughout the year, T. Rex's popularity rapidly declined -- by the time "Zip Gun Boogie" was released in November, it could only reach number 41. Finn and Green left the group at the end of the year, while keyboardist Dino Dines joined. The decline of T. Rex's popularity was confirmed when 1975's Bolan's Zip Gun failed to chart. Bolan took the rest of the year off, returning in the spring of 1976 with Futuristic Dragon, which peaked at number 50. Released in the summer of 1976, "I Love to Boogie," a disco-flavored three-chord thumper, became Bolan's last Top 20 hit. Bolan released Dandy in the Underworld in the spring of 1977; it was a modest hit, peaking at number 26. While "The Soul of My Suit" reached number 42 on the charts, T. Rex's next two singles failed to chart. Sensing it was time for a change of direction, Bolan began expanding his horizons in August 1977. In addition to contributing a weekly column for Record Mirror, he hosted his own variety television show, MARC. Featuring guest appearances by artists like David Bowie and Generation X, MARC helped restore Bolan's hip image. Signing with RCA Records, the guitarist formed a new band with bassist Herbie Flowers and drummer Tony Newman, yet he never was able to record with the group. While driving home from a London club with Bolan, Gloria Jones lost control of her car, smashing into a tree. Marc Bolan, riding in the passenger's seat of the car, was killed instantly. While T. Rex's music was intended to be disposable, it has proven surprisingly influential over the years. Hard rock and heavy metal bands borrowed the group's image, as well as the pounding insistence of their guitars. Punk bands may have discarded the high heels, feather boas, and top hats, yet they adhered to the simple three-chord structures and pop aesthetics that made the band popular.